Until recently, it was a sign of political correctness not even to consider the possibility of a euro collapse. Investment experts at Deutsche Bank -- Germany's largest bank -- now feel that a collapse of the common currency is "a very likely scenario." Germany's second-largest bank -- Commerzbank -- has also flagged fears of a Eurozone collapse whilst bracing for a worsening of the euro-crisis. "The greatest downside risk remains an uncertainty shock from an escalation of the sovereign debt crisis, ie, the collapse of the monetary union," Commerzbank states in its latest quarterly report released this week, adding that it thought the risk was higher now than in autumn last year. Italian Prime Minister Mario Monti has also warned of the “psychological break-up” of Europe if the euro crisis is not soon resolved. Spain and Italy, the two chief trouble spots, are threatened with a financial collapse that could tear the 13-year-old currency union apart and rock the global economy. The World Bank has also warned that the euro collapse could spark a global crisis. It isn't easy to predict how such a tornado would affect the global economy, but it's clear that the damage would be immense. Is the euro about to fall further, possibly leading to serious concerns about a devaluation spiral of the European single currency? Over the last three months, the euro has lost around 5 percent of its value against a basket of major currencies. Against the US dollar, it has lost around 8 percent. Is there a need for a more clear signal that the Eurozone debt crisis has now reached the global currency markets? How Big Is the Eurozone 'Flight-of-Capital'? 3. Locals are also moving their money abroad, often from the local branch of a Eurozone bank to an overseas bank outside the Eurozone to stem the extent of their potential losses in the event of a devaluation of the euro. What Has Caused The Surprising Delay In the Euro's Correction? What's surprising is that the euro's correction did not happen sooner and was not a great deal more pronounced than what we have witnessed more recently. The answer lies in the three-phase pattern of the now five-year-old global financial crisis. 6. The general trend was one of substitution from the periphery into the core Eurozone countries, ie Germany, France and the richer north. 5. As a result, the net deterioration in the value of the euro was much less pronounced than inflow dynamics alone would have suggested, and it played a role in containing euro weakness by making it appear more moderate than many had expected. Has The Flight of Capital From The Eurozone Begun? 1. The third phase of the crisis has now begun and it shows a remarkable new element: domestic investors in the Eurozone are starting to "push more money abroad," in a dynamic like the ones we have witnessed in traditional emerging market currency crises like the Asian and Latin American crises. f. The idea of capital flight into non-euro zone markets from Eurozone investors fits with the price action in global sovereign bond markets. Danish bond yields have seen the largest yield compression in recent history and German, Finnish as well as British government bonds also stand out for their extremely low yields. In Greece, Ireland, and Portugal, foreign deposits have fallen by an average of half, and foreign government bond holdings by an average of one third, from their peaks. The same move in Spain and Italy, taking into account the fall that has already taken place, would imply a further 200+ billion to 350+ billion euros in capital flight respectively, skewed towards loss of deposits in the case of Spain and towards the dumping of government bonds in the case of Italy. When we examine portfolio and deposit outflows to-date, what stands out is that it is difficult to divorce Spain and Italy. Spain's banks are in deadly trouble. Their assets and deposit bases are both evaporating. But the government can't afford to bail them out. However, both Spain and Italy have so far experienced outflows that are of a similar magnitude, highlighting that while Spain has been grabbing all the headlines, the market concern is as much focused on Italy. Several months ago, capital outflows from the peripheral Eurozone countries prompted a worldwide dialogue about the significance of the balances of the European payments system known as Target2, as the euro-system -- particularly the German Bundesbank -- took over the financing of these private capital outflows. Economic deterioration, ratings downgrades and especially a Greek exit would almost certainly significantly accelerate the timescale and increase the amounts of these outflows from the Eurozone, turning the process into a step-by-step stampede. Whilst the Eurozone crisis is much more complicated and likely to be protracted, during the 1997-98 South East Asian financial crisis there was substantial flight of capital from those countries. Residents knew the changing nature of risks and rewards earlier than non-residents. Residents' attempt to be the first ones to exit was subsequently identified as the likely cause for precipitating that crisis. As the capital flight accelerated, in parallel, there was a sudden and palpable loss of confidence throughout South East Asian economies. Is the Eurozone mirroring some of the defining features and significant milestones of the South East Asian financial crisis and collapse? Public trust in the single European currency is sliding at a dramatic pace. Is the euro coming close to a tipping point when it might devalue more swiftly? Now that the currency dispute has escalated in Europe, the inconceivable is becoming conceivable, at all levels of politics and national economies. 1. Polls show that the general public may be increasingly turning its back on the euro as the national currency across Europe, while confidence in EU policymakers has significantly fallen -- the perception that the EU is “a good thing” has fallen below 50% in Germany, and to about 30% in Italy and Spain. 2. For all intensive purposes the Eurozone crisis has now entered its third phase, that of "Flight-of-Capital" and this will push the euro much lower. 3. There are growing signs with every passing week that the crisis of confidence in the Eurozone is assuming an ever larger new dimension. For some weeks, it has been apparent that capital is no longer simply flowing from the southern countries to the core countries of the Eurozone, particularly Germany, but actually heading offshore. 4. 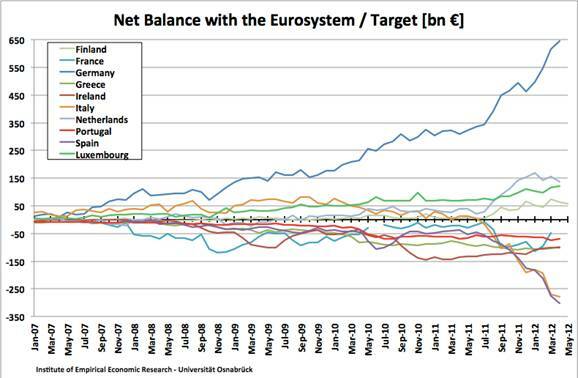 The falling euro is a sign that the Eurozone as a whole is experiencing a net outflow of capital. Whereas initially investors fled to the safety of the Eurozone’s core, now they are taking their capital out of the Eurozone altogether. 5. Domestic and foreign investors seem to be steadily losing confidence in the Economic and Monetary Union, and so are increasingly looking for safe havens for their money outside the Eurozone. Nothing seems impossible anymore, not even a scenario in which all members of the currency zone dust off their old currencies bidding farewell to the euro, and instead welcome back their historic national currencies. We welcome your participation in this Socratic dialogue. Please access by clicking here. © 2012 Copyright DK Matai - All Rights Reserved Disclaimer: The above is a matter of opinion provided for general information purposes only and is not intended as investment advice. Information and analysis above are derived from sources and utilising methods believed to be reliable, but we cannot accept responsibility for any losses you may incur as a result of this analysis. Individuals should consult with their personal financial advisors.